(Dec 1): Loyalty to the party president would not be the reason if Umno should fall in the next general election, said an Umno Supreme Council member, who added that split within the ranks would definitely cause the party to fall. Datuk Seri Ismail Sabri Yaakob, who is also rural and regional development minister, said among Umno's principles were to strengthen the party by solving problems internally and remaining loyal towards the leadership. "When we start going against the leadership, when branches start talking about the leadership, this will cause Umno to split. "And that will cause Umno to lose," he told reporters in Kuala Lumpur today. 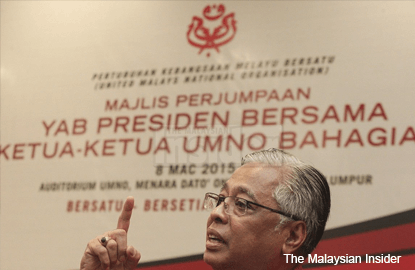 Ismail Sabri was commenting on former Umno president Tun Dr Mahathir Mohamad's open letter to party members, warning them that their continued support of party president Datuk Seri Najib Razak could mean the end of Umno and Barisan Nasional in the next general election. He said another thing that would cause Umno to lose were if members were encouraged to condemn their leaders. Ismail said Umno leaders were not perfect like a prophet, who never made mistakes. “All Umno presidents have made mistakes,” he said, adding that changing a leader would not guarantee Umno’s victory at elections. He said even in Islam, obedience was to Allah, his messenger and leader. Dr Mahathir yesterday urged Umno members not to remain blindly loyal to Najib to the detriment of the country, even though they might be rewarded for doing so.